Iran, the day before Ahmadinejad speaks at the UN, claimed it successfully fired four missiles at a mock sea target representing warships. Iran, the day before Iranian President Mahmoud Ahmadinejad speaks at the United Nations, claimed Tuesday it successfully fired four missiles at a mock sea target representing warships. The timing of the missile tests is part of Iran’s propaganda campaign to instill fear among Israel and American leaders, who have warned that the “military option” is on the table if Tehran does not stop its unsupervised nuclear development and enrichment of uranium that can be used to manufacture a nuclear warhead aimed at Israel. The Ahmadinejad regime has claimed successful military tests at a dizzying rate, but several analysts have said that many of the claims are exaggerated. Earlier this year, Iran said it tested a “long-range” missile but evidence pointed to its being a shorter range weapon. Tuesday’s announcement of the anti-warship missile tests was made by the Islamic Revolution Guards Corps (IRGC), through government controlled news agencies, such as Fars. “The missiles were fired simultaneously at a sea target as large as a warship and sank it in 50 seconds, stated Commander of the IRGC Navy, Rear Admiral Ali Fadavi said. He claimed that Iran's missile systems can reach the entire Persian Gulf coastline and beyond the location of U.S. bases. 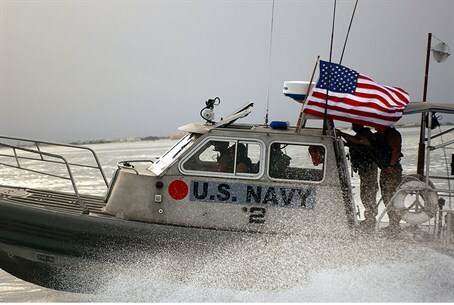 Its capability to hit warships could be critical if the United States and its allies try to close the Strait of Hormuz, the passageway for more than 20 percent of the word’s oil. Showing off Iran’s claimed military arsenal, Fars noted, “In July, the IRGC Aerospace Force test-fired a supersonic anti-ship ballistic missile in the last phase of the Payambar-e Azam 7 (The Great Prophet 7) massive missile war games. “The IRGC also exercised bombing specified targets by fighter bombers and Unmanned Aerial Vehicles (UAVs). “In early 2011, Iran started the mass-production of the Persian Gulf anti-ship missile which is designed to destroy targets and hostile forces at sea. The supersonic projectile, which carries a 650-kilogram warhead, is immune to interception and features high-precision systems.